In the last century and earlier parts of this century whole communities around the coasts of the North Sea depended on herring (e.g., Coull, 1986). This reliance has decreased but herring fishing is still important to some coastal communities. The effects of the collapse of the stock, therefore, varied in different ports bordering the North Sea. There is also some information available on imports of herring over the period of closure and the extent of supplies from other areas. Thus, imports from Canada maintained supplies of herring in the UK while catches in the Baltic were available to Denmark and Germany. As a generalization, however, worldwide supplies of herring diminished to low levels. 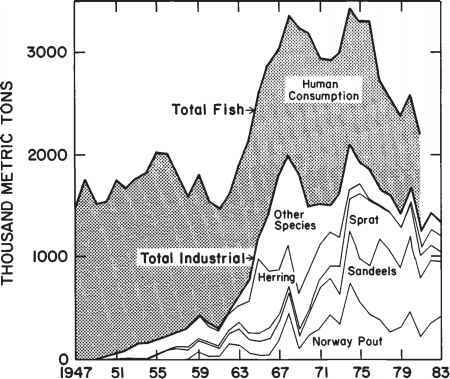 Whereas the total world catch reached a peak of 4.6 million metric tons in 1966, it had decreased to 1.1 million metric tons by 1979 (UN FAO, 1989). The effect on the market of the collapse is well demonstrated by the quantities and percentages of herring that were sold to the home market in Scotland before and after 1978 (Table 10.1). In the period 1971-77 never more than 20 to 25 percent were "klondyked," while most of the landings were absorbed by the home market, which accounted for 72,000 to 94,000 metric tons from 1971 to 1974. During the 1977-82 closure, much of what was available went to the home market and the unit price in both Scotland and other countries in the European Community responded accordingly (Table 10.2). In Scotland the unit price rose by a factor of over 20 between 1969 and 1979. Since the reopening of the North Sea and west of Scotland fisheries, the home market has been satiated at a level of under 20,000 metric tons and the unit price decreased and has stabilized at around ¿120 per metric ton from 1982-88. This lack of growth of the European market has given rise to considerable disquiet in the European Community (Commission of the European Communities, 1987). Clearly, the nonavailability of herring for a number of years has had a major and lasting effect. mackerel and sprat and, more recently, to the migratory western stock of mackerel. Since the reopening of the North Sea herring fisheries in 1983, the European Community and Norway have agreed to a basis for management of the North Sea herring stock in which a set quota allocation procedure is applied to the TAC agreed on each year. In practice, however, the herring fisheries have developed rather unevenly. While major landings are made in Norway, Denmark, The Netherlands, and Scotland, there has been almost no recovery of markets in England, and landings in Germany are relatively low.